Richard W. Sears was born in Stewartville, Minnesota. It was in 1886 at age 23, that his career path changed forever: A shipment of gold-filled pocket watches from a Chicago manufacturer was refused by a Minnesota retailer, Edward Stegerson. Sears stepped in and made an agreement with the wholesaler to sell the watches. At the time, time zones were new and farmers needed to keep time accurately, so Sears had no trouble selling the watches. Within six months, Sears moved to Minneapolis and founded the R. W. Sears Watch Company. He began placing advertisements in farm publications and mailing flyers to potential clients. From the beginning, it was clear that Sears had a talent for writing promotional copy. He took the personal approach in his ads, speaking directly to rural and small-town communities, persuading them to purchase by mail-order. 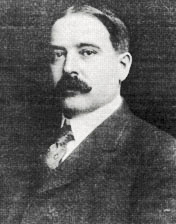 In 1887 Sears moved his company to Chicago, and moved his residence to Oak Park, Illinois. The first Sears catalog was published in 1893 and offered only watches. By 1897, items such as men’s and ladies clothing, plows, silverware, bicycles and athletic equipment had been added to the offering. The 500-page catalog was sent to some 300,000 homes. Sears catered to the rural customer because having been raised on a farm he knew what the rural customer needed. He also had experience working with the railroad and he knew how to ship merchandise to remote areas. In 1908 Sears made another move forward and began to sell mail order homes through the catalogs. In 1908 Sears retired and moved from Oak Park to Lake Bluff, Illinois, suffering from failing health. He died in 1914 at age 51 of Bright's disease.